The Osprey I, carrying 47,650 metric tons of materials to be used in cement manufacturing, arrives from Europe at Port Manatee on Wednesday [Feb. 6], marking the first shipment to the renovated facilities of terminal operator Carver Maritime Manatee LLC. 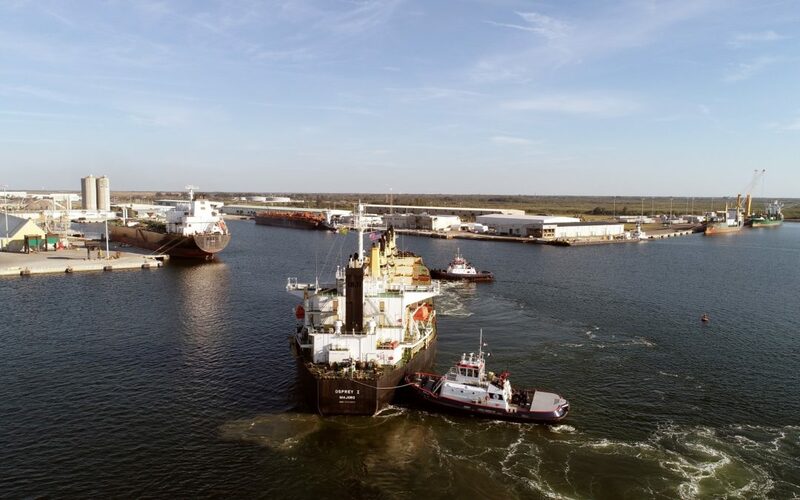 PALMETTO, Florida – Port Manatee has received its first shipment for its newest terminal operator, Carver Maritime Manatee LLC, with arrival Wednesday [Feb. 6] of a ship bringing nearly 50,000 tons of raw material to be used in Florida cement manufacturing. Officials of Carver and Port Manatee shared enthusiasm and indicated additional shipments to the 47,650 metric tons of the bulk material brought from Europe on the Osprey I should soon be arriving at the Central-Southwest Florida Gulf Coast port. Since entering last August into an agreement with Port Manatee that could extend for as many as 20 years, Carver has extensively renovated a 10-acre cargo facility with deepwater access, including rehabilitating a 1,400-foot-long conveyor system on the leased site. The Port Manatee facility is the third maritime endeavor for Carver Companies, which was founded in 1989. The first, the Port of Coeymans, is a 400-acre privately owned and operated maritime industrial complex, opened in 2007 on the Hudson River, 10 miles south of Albany, New York, which has handled such cargos as the steel beams used in reconstruction of the Tappan Zee Bridge. The second was established in 2016 on a former naval base property in North Charleston, South Carolina, and now encompasses 40 acres of industrial laydown and warehousing. Located “Where Tampa Bay Meets the Gulf of Mexico,” Port Manatee is the closest U.S. deepwater seaport to the expanded Panama Canal, with 10 40-foot-draft berths serving container, bulk, breakbulk, heavylift, project and general cargo customers. The port generates more than $2.3 billion in annual economic impact for the local community, while supporting more than 24,000 jobs, without levying ad-valorem taxes. Carver Maritime Manatee LLC’s 10-acre Port Manatee terminal offers deepwater access and features a rehabilitated 1,400-foot-long conveyor system.